Mossos form a barrier between the marchers ACN. Tension, shouts, heated words and some jostling without things getting out of hank thanks, in part, to the presence of the Mossos when two opposing demonstrations came close together yesterday in the centre of Barcelona. The first march had been convened by Hablamos Español and the 1,500 marchers were protesting against linguistic emersion in Catalan schools and demanding freedom to choose education in Spanish. 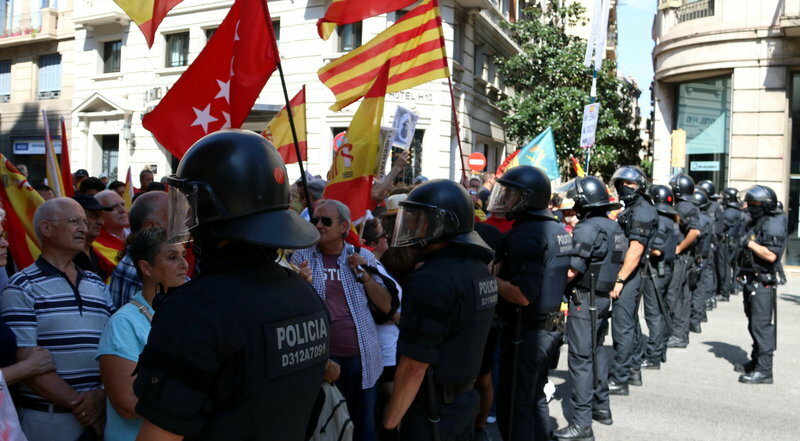 The march was planned to end in plaça Sant Jaume which had already been filled with demonstrators from the Omplim Sant Jaume movement demanding the implementation of a Catalan Republic. Hablamos Español finally agreed to change the route of their demonstration.